The police have arrested a son of former Deputy Minister of Power and Energy and leader of the 1971 insurrection, Athula Wimalasiri Jayasinghe, alias Loku Athula. 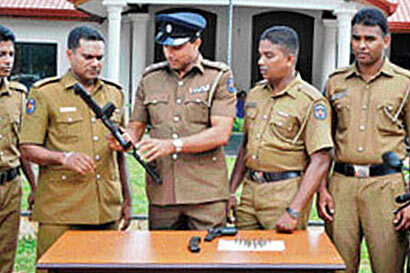 The politician’s son, Sameera Jayasinghe, an assistant Superintendent of an estate, had been arrested allegedly in possession of a sub machine gun, a Browning pistol, 18 rounds of SMG ammunition and one pistol cartridge, the police said. The Mirihana police stumbled on the gang following the arrest of a suspect who had snatched Rs. 200,000 being taken to be deposited at a private bank at Delkanda recently. The Police who followed up on the number of the motorcycle used by the suspect for the getaway, later arrested him with the motorcycle, a shotgun and a stock of ganja at Embuldeniya. Under interrogation, the first suspect revealed details of how a pharmacy owner and another person had been robbed of Rs 200,000 at gunpoint. Under interrogation he revealed that the mastermind was an assistant estate superintendent. With this information the police arrested assistant superintendent of the Hantane Estate, Sameera Jayasinghe on suspicion. On being grilled, Jayasinghe allegedly admitted his involvement in the Rs.2.7 million payroll robbery of the Kendaliyadde Tea Estate at Nawalapitiya and the robbery of a restaurant at Galaha, Peradeniya. The first suspect and the estate superintendent had chummed up when the former had gone to buy trees that were put up for sale by the estate. Mirihana police made a further breakthrough yesterday when another member of the gang was arrested with modern weapons used for VIP security. Several other members of the gang have yet to be arrested, including some army deserters. Investigations are being directed by Senior DIG Western Province Anura Senanayake and Western Province South DIG Sumith Edirisinfghe.